Anonymous depiction of a silk weaver' s atelier, 1820s. The weavers of Lyon represented the impoverished underbelly of the glittering trade in luxury silk. Although the 19th-century "canuts" were notorious for their unrest and radical labour politics, their 18th-century predecessors can seem remote, largely because so few contemporary illustrations survive of their everyday lives. The L'Histoire par l'image website features two19th-century depictions of "canut interiors" from the Musée Gadagne which give some insight into the earlier period. 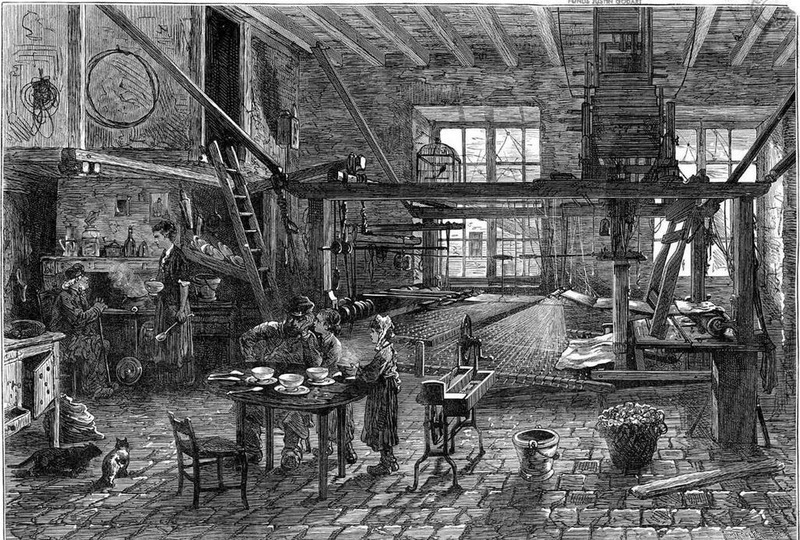 The picture above probably dates from the industrial conflicts of the 1820s and harps back nostalgically to the small-scale production of the past. The costumes recall those of the 18th century and the scene, with its cat and playing children, suggests a certain level of prosperity. The loom is a métier d’unis for making plain silk fabric. Five workers are represented: the weaver himself, his wife la tisseuse who, sitting on the bench of the loom, pulls a chord to set the shuttle in motion. Three other women wind bobbins using different devices. Lyon was the only major urban centre in 18th-century France where the textile industry remained confined within the city limits, and regulation by the guild, La Grande Fabrique, ensured a strong corporate identity among weavers. Of a population of 140,000 plus, up to a third were directly or indirectly dependent on silk manufacture, which at this period had yet to spread out onto the plateau of the Croix-Rousse, the celebrated quartier of the canuts. Instead the industry was concentrated on the right bank of the Saône (Saint-Georges, Port-Saint-Paul, Pierre-Scize) and the slopes of the Grande-Côte to the north, where workshops clung to the hillside to benefit from the light. A small impoverished enclave also existed in the old city itself near the Hôtel-Dieu. 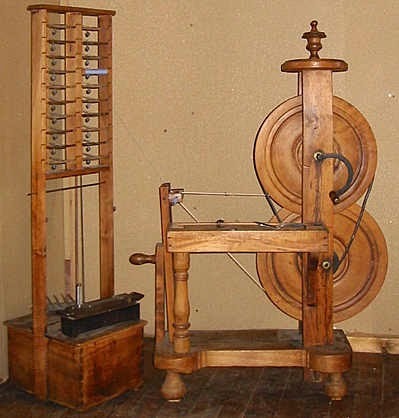 Between 1667 and 1752 the number of looms more than quadrupled - from 2000 to 9400. In 1786 almost 15,000 were in operation. depiction the atelier is sparse and impoverished. All aspects of the silk industry were minutely regulated by the Grande Fabrique; entry into the trade was restricted by letters of mastership and the obligation to complete a chef d'oeuvre. In this sense the weavers were a privileged workforce. The position of journeymen (compagnons) and apprentices was likewise laid down, become progressively more complicated in 1667, 1737 and 1744. Only one apprentice could be employed at any one time, tied by contract, and his parents were obliged to pay a sum to his master. At the end of five years he would be eligible, on payment of 24 livres, to become a compagnon, and after five more years he could apply for mastership at 120 livres. Journeymen could not be paid less than half the price of the product they made and, although they were bound to their masters by credit, advances were restricted. In reality masters and journeymen worked side by side and their interests were closely bound together. In addition the trade employed large numbers of auxillary workers: readers (liseuses) who transposed the patterns from point paper into simples, loopmakers, drawgirls, bobbin-winders (dévideuses) and remetteuses who mended damaged threads and cords. Four looms employed as many as seven auxiliaries, in addition to the weaver himself, his wife, journeyman and apprentice. Most of these workers were women, young girls from the surrounding countryside on minute wages, who represented a transient (and potentially unreliable) source of labour. Many London silk weavers were of Huguenot ancestry. The daily life of all was narrowly dependent on the prosperity of "la manufacture". The classic researches of Justin Godart [L'ouvrier en soie, 1899] showed that the silk industry was susceptible to the slightest slowing in the market. The narrow regulatory framework meant that it was difficult to adapt, for instance by making different kinds of cloth. Even temporary changes, like a period of mourning in the Court could be problematic and, from the 17th century onwards heavy dependence on exports meant that the trade was at the mercy of the international politics. Godard identified no less than seventeen short-term "crises" between 1689 and 1791. Even in the relatively prosperous years before the mid-century, prosperity could be threatened - for instance in 1729 when the Saone froze over and brought transportation to a halt. 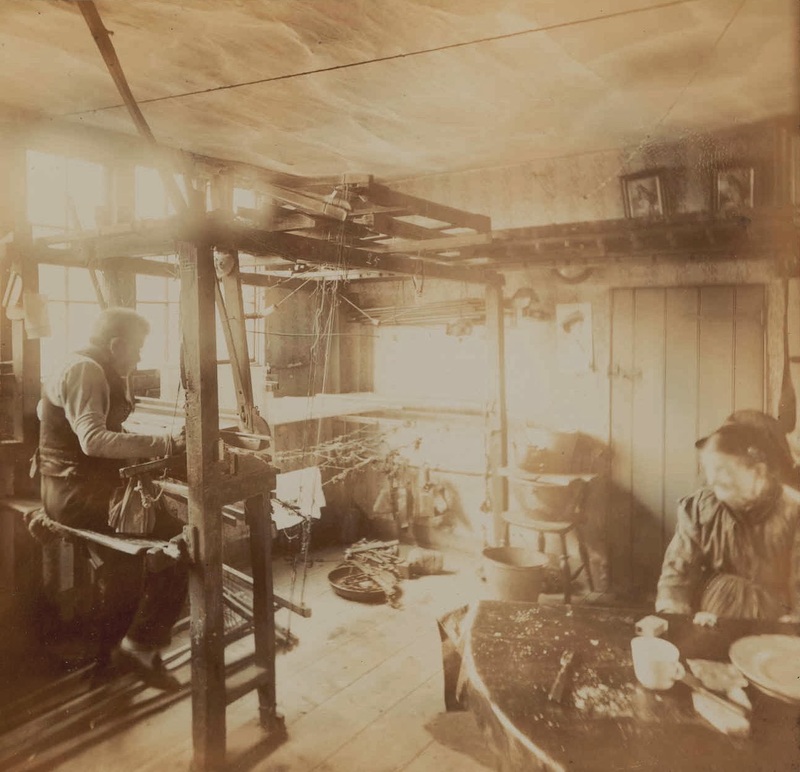 For master weavers, whose enterprises were tightly restricted in size, unemployment or prolonged depression in silk prices could force sale of looms and threatened destitution; for journeymen, apprentices and servants indigence was an ever present threat. Accounts preserved in the Lyon archives, with their minute itemisation of expenditure - salt, tobacco, a coat for the weaver - reveal long hours and tight margins of survival. The rectors of the Charité in Lyon estimated that an unemployed worker in silk could be reduced to penury in a fortnight to a month and in 1725 high prices meant that the town was full of workers who "lived from day to day".